I was excited to try these, but my eagerness began to wane as soon as I opened the bag and took a good whiff. Something about those fruit and vegetable sources gives the bag a mighty powerful and peculiar odor. And then, once I got the bag opened and gulped a few breaths of fresh air, it became apparent that, for the discerning snacker, these jellybeans will require time and perseverance rather than mindless face-stuffing. There are 18 flavors in the bag, which, for the sake of variety, sounds great, but for the sake of determining what the heck you’re about to taste, is maddening. There’s just one blue (blueberry) and one green (apple), so those are easy to pick out. But if you’re looking for a flavor that isn’t blue or green, then you’ve got your work cut out for you. Raspberry, cherry, and strawberry are nearly identical in hue. Mango and pomegranate are the same shade of orange, except that mango has tiny red splotches and pomegranate has tiny yellow ones. (Then there’s passion fruit, which is also orange, only without the speckles.) Coconut is white, while lemon is tinged with only the faintest yellow. At first, I dug through the bag, muttering to myself about what color combination I wanted. Then I started holding up jellybeans to the light, one at a time, and peering at the wrapper to try to compare the jellybean with the picture I hoped it represented. Finally, I gave up all hope of ever being able to find a banana split jellybean on my own and left it to fate to deliver one to me, eventually. My ability to discern what I was eating didn’t necessarily improve once I bit into the jellybeans, either. I never learned to differentiate between the raspberry and cherry, and not for lack of trying. I did like the ambiguous “red” flavor, though, which was both sweet and tart. Most of the oranges blurred together, too, with vaguely tropical but otherwise indistinct flavors. And the lemon jellybean tasted awfully similar to its cousin, lemon-lime. Still, some flavors did stand out. Strawberry smoothie and grape were wonderful. Tangerine had a good citrusy zip to it. And the apple was nicely fruity without the lingering floral aftertaste I got from some of the other fruit flavors. 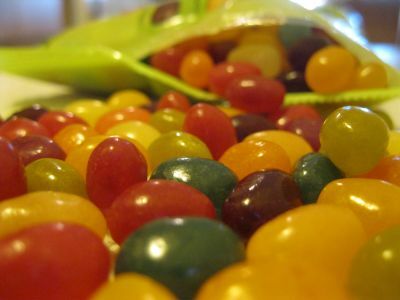 The candies are small, about the size of Jelly Belly jellybeans, with thin shells and thick, chewy centers. I paid $3.99 for a 15-ounce bag. If you’re the sort of jellybean eater who can reach blindly into the bag and then happily chow down on whatever you might pull out, then these are worth a shot. But if you prefer that all your flavors be distinct from one another, in both taste and appearance, then Trader Joe’s Gourmet Jelly Beans probably aren’t the jellybeans for you. If only there was a Trader Joe’s near me – I’d love to try these beans! I like Jelly Belly’s beans but always have to pick around the bubble gum and popcorn flavored beans (and now, caramel popcorn). Thanks for the review!